First, let me go on the record as saying I'm a huge Raspberry Pi fan. If you haven't heard already, a Raspberry Pi is a small but complete $35 computer (or $25 without Ethernet). It's a complete 700 MHz ARM CPU with a GPU and 256MB of RAM. It has two USB ports, Ethernet, Audio as well as video out over RCA (Composite) or HDMI at 1080p. It uses an SD Card for its hard drive and takes 5V at >700mA of power over a mini USB. You can order one from Farnell online and there is a waiting period. All that said, I wanted to talk about some misconceptions one might have about these amazing little devices. It runs Windows 8 - And that's OK. It's a 700MHz Broadcom BCM2835 ARM11. It's a little underpowered to run Windows (not to mentioned totally unsupported) but it can run a lot of different stripped down Linux distributions like Debian or Fedora. The current recommended distro is Raspian and you can download a Raspbian image directly from Raspberry PI and write the image to an SD Card using Win32DiskImager. It's a breeze to setup - Ok, it IS easy IF everything works. It's actually easy until it's totally not easy and then it's almost always a hardware or power problem. What do I mean by this? Well, the idea with the Raspberry PI is that it uses parts and equipment you likely already have. It doesn't even come with a power supply! They figure - rightly so, I think - that you already have a 5V micro-USB adapter laying around your house so why spend money on another one? Good thinking, except a Pi needs power at at LEAST a 5V and 700mA. The former is easy, but the latter is tricky. I had literally 10 USB adapters and only two could do over 500mA. One did 700mA and the other a full 1A. I am not saying panic, but I am saying that the forums are filled with questions and concerns over flaky behavior. I even had to hook up a multimeter and check the voltage over their two (thoughtfully located) voltage test points. I would say that if you have and know how to use a multimeter than you should totally get a Raspberry PI. But if you are a teacher who has the idea that you'll fill a classroom with fast, cheap, reliable and easy to manage PCs, the Pi isn't the answer. It's cheap and fun, but it's not quite plug and play yet. One other point of note, NONE of my wireless keyboards or mice worked, and this is being talked about on the forums as well. The PI can handle only 100mA of draw on each of the two USB ports (get it? ~500mA for the PI and 100mA each for the two USB ports) and some devices pull more than 100mA. Some keyboards have little USB hubs of their own, like the Apple Wired Keyboard and they can't be driven by the PI alone. Expect to need a USB hub for any external drives or devices. I tried 3 different hubs before I had success with the Belkin USB 2.0 7 Port Hub. I also ended up getting a cheap Mini USB wired keyboard and cheap USB wired mouse. The Pi may be $35 but you'll spend another $75 if your parts on-hand don't work. Moral of this story? check all your parts against the Raspberry Pi Verified Peripherals list. It supports 1080p video - Yes, it's good a very nice little GPU on it, and hopefully future versions of the little Linux distros will take better use of it. For example, offloading some of the X-Windows work onto the GPU would make it feel a little snappier. and changing arm_freq=700 to arm_freq=900 as well as adding sdram_freq=500. If you mess it up, just edit the file on the SD Card on another computer. Be aware you can also "overvoltage" but you'll void the warranty immediately. It's a complete Linux machine - It really is. You don't need to use it for anything they expect you to use it for. If you want to install Fedora Remix and make it a little NAS with an attached USB hard drive, feel free. You can make it a tiny web server or use it as a little VNC client while you VNC into your work at 1080p from your 42" HDTV. It's a Media Center with AirPlay - You can run an XBMC fork called RaspBMC that puts together a Debian Linux distro with most of the power of the well-known and open source XMBC media center system. Most importantly, it has AirPLay support so a RaspBMC-running Raspberry PI can be the easiest and cheapest way to throw wireless video on your giant TV from your iPhone or iPad. It doesn't do MPEG2 but it does play MPEG4 and h.264. It is great for learning to code - It not only runs Python but it will run anything that a tiny ARM machine can run, even Mono and .NET! The Raspian default distro of Linux includes Python 2 and Python 3 IDEs and is easy to script. It's a fun educational PC for little kids - With the addition of the GCompris software suite you've got dozens of games and activities that cover everything from math to reading, science to geography. It's a gaming machine - I can say it runs MAME and SCUMMVM pretty darn well and if you check out the forums you'llf find a very interested community with ambitious plans. The Raspberry PI is a tiny little joy. The boys are having great fun with it and frankly I'm happy that it's hard. I don't want them using an Xbox or some "easy" technology. They are using espeak from the command line to get the computer to talk to them and are learning how to read. As they get older I hope we'll start trying out some of the hundreds of other uses for these tiny devices. We spent all day today building a LEGO case then found a clever design online as well. The little Pi community is having such fun and I think it's because of the device's constraints. It's small, it's cheap, but it's got such potential. If you are aware of it's limitations and are armed with a little patience, you'll have a blast introducing your kids to the Raspberry PI. Another good review at PC Magazine. Good point, Stefan. I'm still learning about hardware and GPIO and it's possibilities. Do you have any links on where I can get started? A lot of these sites are geared towards folks who already know what they are doing. For example, maybe I could get a tiny robot and the boys could program it. Scot - some really good points especially that it is a joy for kids, and it is not just a games terminal that they can veg out in front i.e. No pain no gain! From the kids' perspective is they can get their hands on it, touch feel it, own it, understand it, etc etc. I have enjoyed watching my son entering games programs from MagPi magazine just like I used on a BBC Micro. Here's a link to a speech controlled robot arm using the Raspberry Pi with full instructions of how replicate. Glad you like the Pi! How old are your kids? At what age do you reckon kids will be able to enjoy this? 5? 6? My problem (and I'm not the only one) with the Pi is the Broadcom chip it uses which can only be used under NDA (http://www.raspberrypi.org/archives/169). So it's not really an open design from a hardware perspective. IMO, the board layout kinda all over the place too and not very elegant. I'm more of an AVR/Adruino guy I guess. But I if were to get into Linux SBC's I'd get either a BeagleBoard or BeagleBone (http://www.adafruit.com/products/513). Not sure why there's so much hype over this Pi thing. I guess it's the "zomg, $25 computer" media hype. I suppose for $25 (isn't really $35 now?) it's not bad to play around with. But yeah, it's not really a "computer" in the traditional sense that the media would have you believe. The Raspberry Pi is a educational tool initially designed to teach Computer Science in UK schools. The raspberry Pi foundation is a charity, hence the low price as it's cost only. As for the the media, they always over hype anything they get their hands on. Here's a link explaining the rational behind the Pi and much more, without any media hype. For myself I would actually say the Pi is more of a traditional computer than most things on the market today. The Raspberry Pi is a pretty great deal but I'm really looking forward to competition with more powerful dual- and quad-core boards so I can build something akin to a hand-held Gnuradio-powered software-defined radio receiver/transmitter. A little more expensive, but more powerful is the Cubox from Solidrun. I've it with an Arch OS, and it's very reactive. But I think I'll open mine to use the Lego case !! Rabitguy there is the odroid-x if you want more power. Really informative article about the pi. I agree to the first two myths about the raspberry pi. But in my case setting it up was easier than I ever thought it would be. I had came across multiple threads about incompatible hardware. But all my existing hardware happen to be compatible with the pi. I use a Logitech wireless k350 keyboard and a mx518 mouse which just worked fine. My HTC sensation charger 5V 1A was able to power up the pi without any hassles. And the ubiquiti nanostation 2 could connect wirelessly to my WiFi setup at home providing connectivity via ethernet port. And the facts about the same, the pi seemed to play 1080p videos so effortlessly. I was even successful in getting pi to render(CPU based) 3d geometry using aqsis open-source renderer. That said I have admit the fact that , like you mentioned browsing experience is still not as fluid as someone would expect. I've had my Pi for a month now. Maybe you got one from a batch that isn't as efficient. But I'm powering a Logitech wireless USB keyboard and USB powered speakers off it (250 and 500mA, respectively). I've got it configured as a wired Airplay speaker. Eventually, I'll switch to battery power and replace RJ45 with USB wireless. A great, fun, inexpensive gadget. I've given up on cheapo USB chargers and just buy the more powerful, high end chargers (iPad and the Nook Tablet chargers output 2.1 amps). You could have saved yourself a lot of money by swinging by the Apple store and picking up one of their USB chargers. What I'm really looking for is inexpensive controller boards to drive the motors in our robots and LED lights. I should probably ask this on the Raspberry Pi Forums, but does anyone know if i can just hook this up to an ethernet switch, insert the raspbian distro and boot? Could i then just SSH into the box to do the configuration of thing or do i HAVE to hook up a Keyboard and Mouse to it? 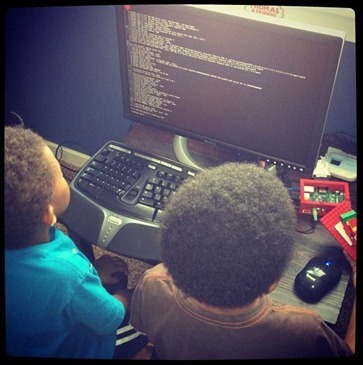 @Scott: Btw, it's called "Raspbian" (Rasp + bian) not "Raspian" :) Otherwise, nice article! It is worth noting that any armhf (hard-float) based images have issues with parts of mono - apparently a subtle issues exists in the floating point ABI that fouls up the expected calling conventions. If you are looking for solid .NET / mono support stick with an armsf (soft-float) build - they are a touch slower but you won't get random exceptions and segfaults. This has been reported upstream and will be fixed in future Debian builds. Generally speaking the model B raspberry PI was designed only for <100mA USB devices! That is because the PI's PSU was chosen with a power budget of 700mA in mind of which 200mA were assigned to the two USB ports, so the raspberry PI's (poly)fuses were designed only for <100mA devices, and typical 140mA polyfuses will have as much as 0.6 volt across them when drawing currents near the 100mA limit. As a consequence the USB ports are only directly suitable for "single current unit" USB devices which according to USB specifications are designed to work with just 4.4 Volt. Not only do non single current unit devices draw more current, (causing greater Voltage drops, and greater stress on the fuses) they also might require 4.75 Volt to work. Therefore any non single current unit devices will only work when powered from a powered hub. Can someone please explain to me why the Pi is good for those looking to learn to code in python or scratch? Both are cross-platform, and both rely very little on the OS they run in, at least at the basic level. Jacob - My kids are 4 and 6. I would say as soon as they start reading they can start typing stuff at the command line. Ultimately my perspective is always "if they are interested, great, if not, also great." If my kids weren't into it, I'd try again in 6 months or just give up. Wow, the most wonderful computer case I have ever seen :). About AirPlay, can it stream videos from iTunes or MKV files from external harddisk? To enable the kids to try hardware wiring/design more freely for themselves, there is the PiFace that protects the GPIO of the Raspberry Pi. "I suppose for $25 (isn't really $35 now?) it's not bad to play around with. But yeah, it's not really a "computer" in the traditional sense that the media would have you believe." That's exactly the sniffy response from the 'pros' to the Sinclair ZX81 when that came out, way back when. But let me tell you that with its 16k RAM-Pack I did real work with that little 'toy', real work at work that is. So much so that it opened my employers' eyes to the potential of microcomputers, well pre-PC days. On the strength of what the ZX81 was achieving they invested in a TRS80 with floppy disk (! ), and that was the start of much bigger things. The Pi's motto should be "Who dares, wins". It only requires imagination and determination, something that by default kids have in adundance, and which this device can only encourage. "Can someone please explain to me why the Pi is good for those looking to learn to code in python or scratch?" 1. It's cheap. A PC is not. 2. Your python (or whatever) program can't screw it up. Well it can can, but it won't bring down the wrath of the rest of the family who now can't email, browse, play their game, etc until someone has done a system restore or otherwise sorted out the mess. 3. It's cheap - so every child in the family can have one, a little sandbox in which they can wreak havoc if they wish without hurting their big sister's PC activity. 4. When a real screw up occurs, Daddy can easily sort it out by rewriting the SD Card with a fresh OS image. Child or adult, if you have your own private PC/Mac and simply want to learn Python (or even some other language, from C to C#), there's no point in a Pi. If you don't have your own private PC/Mac and want to learn Python (or C through to C#), it's ideal for the above reasons. And you can write I/O code to control stuff so much more easily. Fantastic article, I love the PI (I have 2) and I have purchased them to replace my old media centers in the kids rooms (XBMC in old xboxes) and to teach them like yourself. It will be very interested if you can post more information on how you are using it with your kids, and what techniques (ie games) you are using to help them learn. Hopefully is as a good as your keyboard mash app :). including links to all the important stuff like where to get the $9 tiny Wifi nano USB as well as how to run the Raspberry Pi in "headless" mode. The RPi is not really plug-and-play but it is super powerful and amazingly cheap. I think there is a big difference between actual and rated current draw. These speakers are rated for 500mA but I wouldn't be surprised if they actually used a 1/5 of that. The wireless USB keyboard is rated 250mA but since SSH is enabled it hasn't been necessary to plug it in. Also, the latest version of Raspbian enables SSHd be default so there is no need to do even plug in a keyboard for initial configuration. The Pi may be $35 but you'll spend another $75 if your parts on-hand don't work. Also, it looks like some people are coming together with kits for this. My local pharmacy and grocery stores are now selling USB wall adapters for $10 and you can get USB cables at the dollar store. It seems like with a little hunting you could assemble the basic cables in an inexpensive kit for <$20. I would assume that most people at least have a keyboard, so you really just need HDMI, USB-mini, wall-to-USB, network, SD card. Regarding the power supply concern you brought up: we make a very compact power supply module for the Netduino Go! that will also meet the needs of the Raspberry Pi comfortably. So, I didn't get the Windows 8 response. Does it run Windows 8 poorly, or not at all? Robert - Today, not at all. Tommorow, dunno but my guess is not at all. It's cool gadgets for kids as well as to all as it help to gain educational knowledge as well can watch videos over it. I will check this out for more info here. Thanks! You sold me on the idea. I'll probably use it for odd jobs, maybe web server. The $70 Android 4.0 MK802 Mini PC looks interesting as well. As always nice article. It's very nice that you talk about scummvm... I know the guy who is responsible of the project, if you want to talk a little more about it tell me. Me: "Hmmm, I wonder if that thing will run Android? Then I could use it as an inexpensive home theater client for my Monsoon Vulkano video slinger thing. Teh intarwebs: "Excuse me, did you see this timely article?" Me: " o_O Shut up and take my money!" Android 4.0.4 Ice Cream Sandwich is being ported now, and should be available in beta by the Fall, but, without a touchscreen (especially without multi-touch) it's not going to be as fun as a typical Android mobile device. Its 700 MHz ARM processor speed means a lot of heavy-duty apps won't run well, especially if they need a lot of RAM. The key to the Pi is the 24 GFLOPS GPU that's reportedly capable of rendering 40 million shaded polygons per second using Open GL ES 2.0, which is about four times more powerful than what's in an iPhone or iPad, and they're pretty nice game devices. The GPU is what actually boots from the SD card, it generates the 1080p HDMI and composite video output, and the ARM CPU is really only there for USB 2.0 and 100 Mbps Ethernet I/O, as well as integer and logic program execution via Linux, and other sundry housekeeping functions. Browsing and other activities have been steadily improving with each OS release update, to the point where they're usable in casual situations (e.g., not trying to design a mission to Mars, although you could easily run the navigation and many other operational functions with a cluster of these :) ). All of these other "cheap" single-board systems mentioned are two-to-four times as much as the Pi, some are vaporware, and none seem to be selling in anywhere near the numbers that the Pi has, nor do they have anything like the broad community of both tech-savvy and student/educator/home users. Being a real general-purpose computer, it can be programmed to do a lot of things, just not at the speed of heat, except for graphics, which scream. Now that Raspbian is out with floating-point hardware support, CPU performance is much improved and, once X Window (note it's not plural and there's no dash) acceleration via the GPU is achieved (possibly many months from now), the system will be very responsive. In any case, there's more than enough in the Pi that can keep kids busy for literally a lifetime, not to mention providing them very useful skills that will make them valuable employees and citizens for that same lifetime, whether or not they decide to pursue a technical career. BTW, you can now order as many Model B Pi boards as you want, and delivery will occur within a few weeks to a couple of months, depending on the size of the order and other larger orders being processed. Model A boards without the Ethernet port and only one USB port should also be available in the Fall. 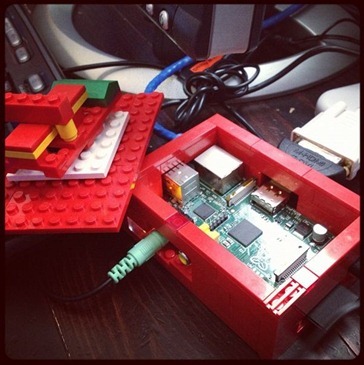 The Raspberry Pi is the ultimative geek platform! I just built a piggyback board to connect it to stepper motor controllers and alike, it seems people get interested in it (http://t.co/BXfFkoB0). I think this tiny little computer will revolutionize the homemade robots, CNCs, home automation,.. you name it. Even if it was Eben Uptons primary intent to build an educational platform it is so much more than this. "It uses an SD Card for it's hard drive". it should be 5V at 700mA (Not mAH). mA means milliamps, which is a measurement of current. mAH means milliamp hours, which is a measurement of capacity. A battery's capacity will often be specified in mAH - and it's simple: for example, if you have a 2000mAH battery, it can supply 2000mA for one hour, or 1000mA for 2 hours, or 4000mA for 30 mins (ignoring other properties of the battery; you get the idea). Ah, read a little further and noticed you used mA throughout the rest. Must just be a typo, sorry for patronising. Is it possible to use the powered USB hub to power the RasPi using a USB to Micro USB cable? I'm trying to find out if I can eliminate a power adapter. I'm using one R-PI for the usual XBMC thing and my second one as a simple webserver. It's also nice to see Raspbmc, Raspbian and OpenELEC evolving and getting tighter. That said, I really should invest in a proper case at this point. I haven't played with mine yet.. wanted to build a mini cluster to see how say 6 or so work together... not sure if it will meet my needs, but could be a cool toy... Hoping Debian proper gets a bit further along, and the kinks with Node.js and MongoDB get worked out a bit better as well... could be a fun toy. As to the comments on more powerful boards most of them are far more pricey, to the point you may be better of considering an ITX board with an AMD E-?50 series processor, or even one of the higher end Atom boards. Either of which is a bit more capable... no GPIO, but that can be done with USB adapters, and more flexibility and compatibility... not a match in size, but sometimes it isn't worth chasing the price to fit. i like the price and was thinking of getting one each for my kids for their "learning computer". Does anybody have any advice finding cheap compatible monitors? Karl - Any HDMI HDTV will work. 1080p is best. MPEG2 IS SUPPORTED now, you just have to buy a licence for it (currently £2.40). I've bought the Rev 2 model with 512 MB RAM and if you use the Raspbian OS distro and edit the config.txt on the SDCARD from your PC/MAC, you can choose what ever VGA/DVI resolution you want (more or less). I've configured mine to run 1280x1024 on a 15" monitor with a HDMI -> DVI cable. Very simple. Secondly I have now installed MONO so I can compile C# on my Windows 7 and build it on a shared folder so I can run it from my Raspberry PI. GTK as GUI is rather easy to work with if you know Windows Forms. You say that it could be a private webserver or a NAS, but would you say that it has enough juice to do both? Sorry if this has already been mentioned, but regarding it as a great machine to learn how to program: It should be mentioned that while it does support Python 'out of the box (or rather, out of the SD card with raspbian distro on it :) ), it also --like every other linux distro, supports C and C++; also, to my delight, the Nano text editor has color coding enabled for C/C++ by default. One of the reasons I got the Pi was to 'force myself' to learn C/C++ because my main computer(s) provide to many distractions (the university I go to concentrates only on Java unfortunately). Just a comment on the voltage issue with the USB cable. Simply buy a 5V adapter with USB, and plug it into the wall like a cell phone. Hi how easy is learning python for a computer novice, I was thinking about purchasing one for my kid who has no programming knowledge. Also is it possible to use a wireless outside camera and have the PI inside? I would like to point out that the raspberry pi works very good for web and email checking. You are just using the wrong browser. You need to use Netsurf instead of midori. Early 8n the days of USB power siources were required to limit current to 500 mA at 5 volts DC. It remains part of the specification. One reason was that battery charging should be current limited and was considered one use of USB ports. The newer, and proclaimed better, devices put out more current but are a bit dangerous when there are still chargers that depend on thee specified current limit.